Going through Shelby’s archives I bookmarked her Apricot Cashew Quinoa Breakfast Cookies, Flour Tortilla and her Date Scones but ended up making her quinoa salad with mango, black beans, and cilantro lime dressing because I had all the ingredients on hand and I just love trying new salads and recipes using quinoa. While quinoa (keen-wa) is usually considered to be a whole grain, it is actually a seed, but can be prepared like whole grains such as rice or barley. 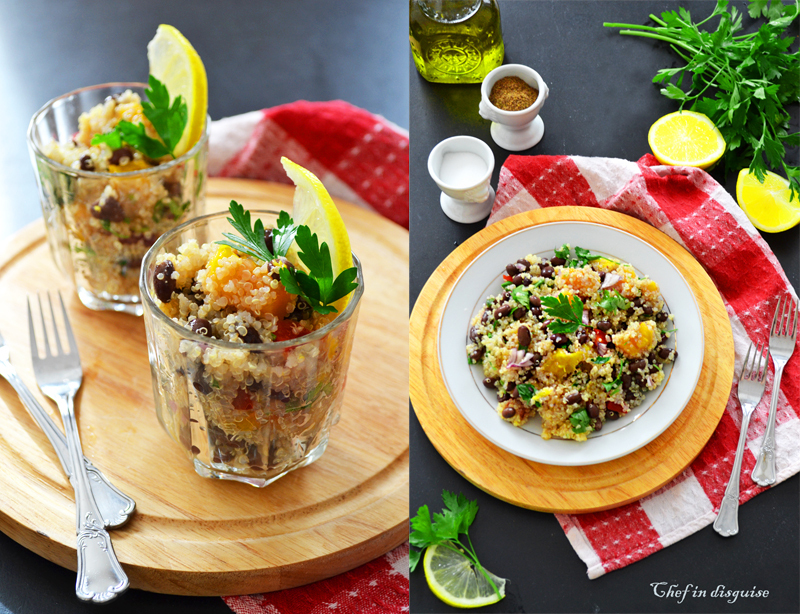 (You can check out my detailed post on how to cook quinoa here). Compared to whole grains, quinoa has the highest protein content,and it provides all 9 essential amino acids, making it a complete protein so it’s perfect for vegetarians and vegans. Quinoa is also gluten-free and cholesterol-free. It is also a good source of dietary fiber, phosphorus and is high in magnesium and iron. It is also a good source of calcium. The best part is quinoa is a super food that is very easy to prepare, it is tasty and versatile. 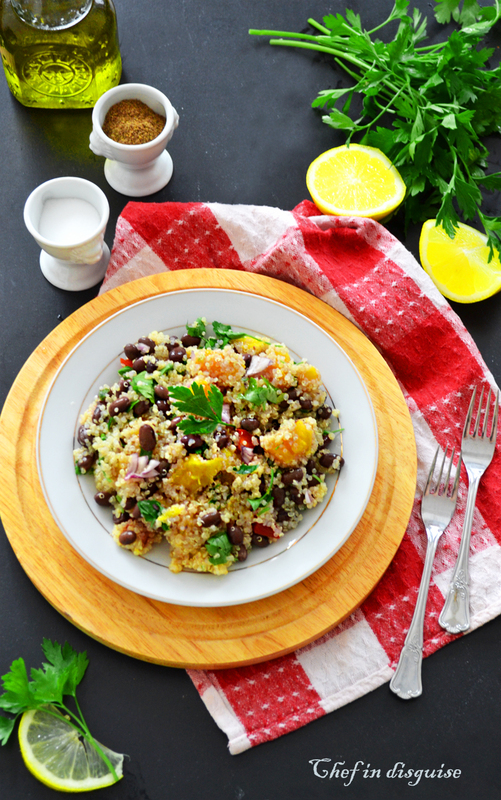 This quinoa salad was a refreshing blast of colors and flavor. The mango and the dressing added a sweet note that was balanced by the lemon juice and the freshness of cilantro. I slightly adapted the recipe by using lemon juice instead of lime and olive oil instead of grape-seed oil and honey instead of sugar for the dressing and I added cilantro to the dressing as well the result was a hit with the entire family. Add quinoa, stir and allow the water to come back to a boil, then reduce heat and simmer about 12 minutes or until all water is absorbed. Remove from heat and place in mixing bowl to cool. Dice peppers, onions and mango into small pieces. Drain and rinse black beans. Measure 1 cup. Add vegetables and beans along with chopped cilantro to cooled quinoa. Pour over quinoa mixutre and toss to coat. 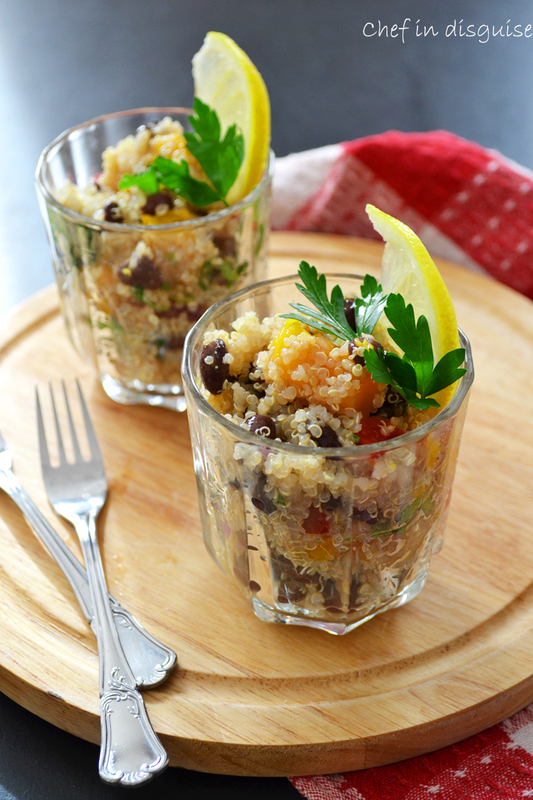 Posted in Appetizer, Arabic and middle eastern recipes, Quinoa, Salad, vegan, Vegetarian and tagged black beans, how to cook quinoa, mango, nutritional value of quinoa, quinoa, quinoa mango and black bean salad, Quinoa salad, what is quinoa. Bookmark the permalink. Oh this salad looks yum. I have yet to try quinoa. I think I’m going to pick up some on my next trip to the supermarket. Glad your family enjoyed this recipe! I love quinoa, something about it just gives me a bit of comforting satisfaction! I am always collecting recipes for quinoa, and this one is going to my files, love everything, including the dressing! YUM! I love quinoa salads! Sawsan, this salad looks incredibly fresh, healthy and delicious!! This is a beautiful, beautiful salad both in looks and ingredients. Altho’ winter has almost struck in Australia with a few cold bursts from the Antarctic, I DO eat salads all year. I may even ‘horror of horrors’ try this with tinned mango as ours won’t come to the market for half a year – at least I’ll get some idea of the possible taste sensation 🙂 ! What a coincidence, we had a quinoa salad with a poached egg for supper last night. I dressed ours with a Dijon and white balsamic dressing and it was delicious. Hope your weather is starting to be spring-like, we’re hoping for +20C by Friday, which will be a nice change from the 8’s and 10’s of late. It looks yummy , thanks for your sharing! You’ve ticked all my boxes with this dish – brilliant combination! I have five packages of organic quinoa in my pantry. I want to make something that looks this good! The salad sounds flavorful and refreshing. Katherine had something similar at a restaurant and I never tried to make it at home. Now I have the perfect recipe. Looks beautiful Sawsan – so fresh and light and healthy. Full of colour! It looks tasty ,thanks for your sharing! Can’t wait to try hopefully very soon!